Members of the Margery Allingham Society enjoyed a behind the scenes tour of the City of Westminster archives. The archive, combining the records previously held at the Victoria Library and the Marylebone Library are stored over five floors. The records are computerised but the microfilm records are retained as they are sometimes easier to search than the digitised version on the internet. The oldest record is a charter signed in 1256 by King Henry III. As a prelude to the talk, members saw a map of Westmister showing where each bomb that hit the city during World War II as well as photos of how people coped during the blitz. A particularly evocative artefact was the school exercise book used by the local Air Raid volunteers to log all fires spotted from their rooftop vantage point. 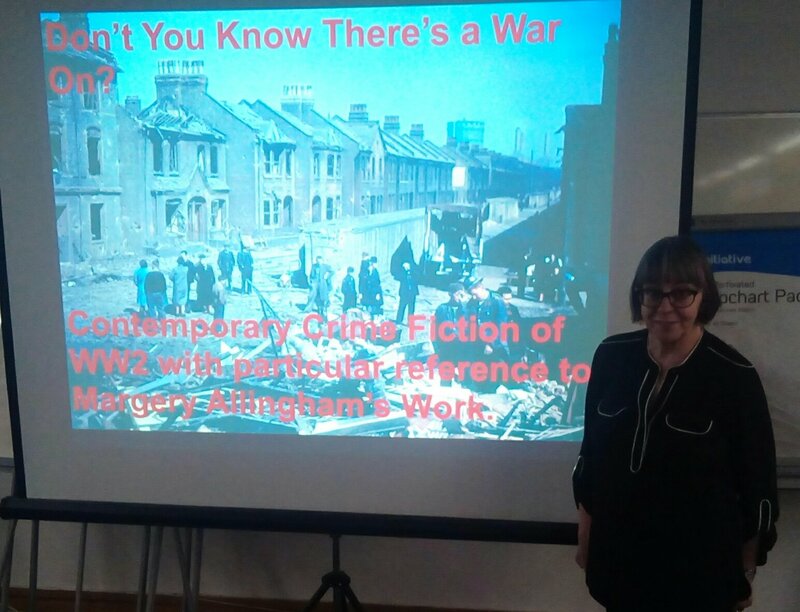 Dr Jennifer Palmer then gave a talk on crime writing during the war years. She explained that all the major writers of crime fiction continued to write throughout the period but there wereidentifiable differences in approach. There continued to be a desire to read detective fiction and production of cheap paperbacks enjoyed success in spite of the paper shortage though it did lead to the use ofthinner paper and denser print typefaces to make the best use of the materials. Lending libraries, public libraries and commercialibraries such as those run by Foyles and Harrods thrived. Agatha Christie lived in London through the bulk of the war years and wrote nine novels during that period. Only two of these, however, specifically addressed war-related topics: One, Two Buckle My Shoe, which referenced Fascist issues, and N or M? whi h is a Tommy and Tuppence spy thriller. She also published after the war Taken At The Flood which looks backto a death that took place during an air raid. Patricia Wentworth published ten books during the war years and the only real indication that there is a war on is that Miss Silver struggles to get hold of sufficient wool to feed her prodigious knitting habit. Indeed, it seems like the upper middle class country set, which was the usual milieu for the detective fiction, was almost immune to the depradations of rationing that affected the lower classes. Wentworth appears particularly out of touch in The Traveller Returns in which a female protagonist describes being in France during the occupation and being allowed to recover at home from pneumonia before being taken to a concentration camp (in France where there were none) and then being sent home again when she once again falls ill.
Gladys Mitchell also wrote nine books duri g the war but in only two does the,war itself feature. She does, however, include much convincing period detail in these. Christiana Brand wrote perhaps the most well known of the crime novels with a specific war setting, Green For Danger, set in a military hospital during the height of the V1 onslaught towards the end of the war. It is keft to G.D.H. and M. Cole to provide the only major novel with a working class setting, Murder At The Munitions Works. Cyril Hare and Nicholas Blake provide insights into the workings of the civil service duri g the,war years, offering a critical outsider’s perspective in each case, for example in the former’s With A Bare Bodkin. Margery Allingham wrote five books during the war. Black Plumes, published in 1940, during the so-called phoney war, makes no mention of the,war beyond a passing reference to the use of the black plumes of the title at a funeral when such ostentation had fallen into disuse given the huge increase in the number of interments now taking place. Margery did moan about the difficulties of concentrating on the apparently frivolous task of writing popular fiction when all around her peoe are,spending their spare time combing the neighbourhood in search of German paratroopers infiltrating the country disguised as nuns on bicycles. The Oaken Heart is a non-fiction account of the impact of the war on the small Essex community where she lived, taking in refugees and coping with the small everyday inconveniences of being at war. Traitor’s Purse is an altogether different take on the same period. Campion spends much of the novel suffering from amnesia and his confusion may be read as a metaphor for the state of the country at the time – more bewildered than anything else. The novel plays on the fears of a home grown fifth column that were orevalent at the time. The central plot to de-stabilise sterling was dismissed as far-fetched at the time but, after the,war, it was found that the Germans had in fact drafted plans for just such an economic attack so her work was, in fact, prophetic had anyone in power but known at thetimeof its publication. Coroner’s Pidgin is set towards the end of the war. Campion reflects on features of the total war that the country had undergon: the random impact of bomb damage, everywhere being boarded up, the huge number of uniforms of all descriptions on the streets. He laments that “My city has been destroyed.” The plot, once again, touches uncannily on fact: in this case the plans by Germans to secure for their own benefit works of fine art from Britain’s public and private collections (much as they looted such treasures on the continent). The question therefore arises, when considering the detective fiction output during the war years, why did so little make reference to the war? Was it censorship? Letters and newspapers were routinely censored. Fiction, apparently was not, though Agatha Christie was once asked about the choice of the name Bletchley (the country’s codebreaking centre) for a character in one novel. Her response: the character was a bore and she had spent a oarticularly boring hour in an unscheduled stop on a train to her nearby home kept waiting at Bletchley station. Was it lack of knowledge? Again, this seems unlikely since all (with the exception of Wentworth) could and did include accurate background detail and colour for wartime settings but chose to do so for only a handful of their novels. Does wartime not provide a good fit for a classic detective fiction story? It does appear an added complication..Characters are in danger of being killed off in a random fashion which can interfere with the elegant plotting which is key to the genre. So this may be good reason to set it aside. Of course, the war provides greater scope for the spy thriller than the whodunnit. So there may be a tendency to go for the easier option. Certainly in the early years of the war there may well also have been some effect from the use of plots devised prior to the outbreak of hostilities. It would be difficult to shoehorn relevant details of the war into a pre-existing scheme. The most likely explanation, however, is that then, as now reading detective fiction was a form of escapism. If popular demand is to read about unexplained deaths in the cozy surroundings of an upper middle class country house as a means to forget for a moment the tedium of the ration queues, shortages and blackouts then commercial authors must write to that demand. What soldier serving overseas wants to be confronted with the risks of the random bomb falling on his loved ones at home when he can read how at the end of a story the guilty are found out and get their just deserts and law and order is restored to its proper place?